The Bhagavad Gita is known as the Song Celestial. It is the most important sacred text in the Hindu tradition. The Bhagavad Gita is some 700 verses and is a part of the great epic Mahabharata. 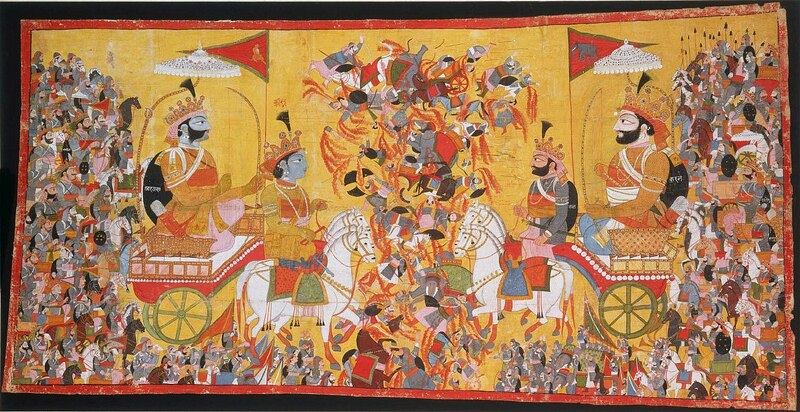 The backdrop to the Bhagavad Gita is the battle of Kurukshetra between the Pandavas and the Kauravas. Arjuna finds himself reluctantly fighting for the Pandavas against his cousins the Kauravas. Before the start of the battle Arjuna is a given a choice between having the help of either his beloved friend Krishna or the entire army of Krishna. Without hesitation Arjuna chose to have Sri Krishna as an adviser, rather than his army. Most of the Bhagavad Gita comprises the discourse that Sri Krishna gave to his disciple Arjuna on the battlefield of Kurushetra. The battle becomes a synopsis for life and provides Sri Krishna the opportunity to explain to Arjuna the philosophy of Yoga and Vedanta, in a practical and meaningful way. Hell has three gates : lust, anger, and greed. The Gita begins with Sri Krishna explaining the essence of man is not the body but the immortal soul. On the eve of battle Arjuna is filled with deep misgivings; he feels to kill his relatives and friends would be a great sin. But Sri Krishna replies that Arjuna should not seem himself as the doer. It is only God who gives and takes life away. By revealing his universal form, Arjuna views Sri Krishna as not just a friend, but as an Avatar or incarnation of God. It is quite apt to note the English writer Christopher Isherwood would later comment on the Gita as being “like a university lecture delivered by God.” Their relationship changes from good friends to Master and disciple. It is Sri Krishna’s revelations that give the Gita its Divine power. Sanjaya the scribe of the Gita remembered the words of Sri Krishna and this is why the Gita is usually looked upon as śruti, or revealed knowledge. Even though technically the Gita is Smrti because it was later remembered and written down by Sanjaya. Whatever you do, make it an offering to me -- the food you eat, the sacrifices you make, the help you give, even your sufferings. No one who does good work will ever come to a bad end, either here or in the world to come. I have become Death, the destroyer of worlds. It is true that the mind is restless and difficult to control. But it can be conquered, through regular practice and detachment. Those who lack self-control will find it difficult to progress in meditation; but those who are self-controlled, striving earnestly through the right means, will attain the goal. Knowledge, the object of knowledge and the knower are the three factors, which motivate action; the senses, the work and the doer comprise the threefold basis of action. For certain is death for the born... And certain is birth for the dead... Therefore, over the inevitable Thou shouldst not grieve. Out of compassion, I destroy the darkness of their ignorance. From within them I light the lamp of wisdom and dispel all darkness from their lives. No one is even equal to You in the three worlds how can there be one greater than You O Being of Incomparable Glory. But, you are not able to see Me with your physical eye therefore, I give you the divine eye to see My majestic power and glory.